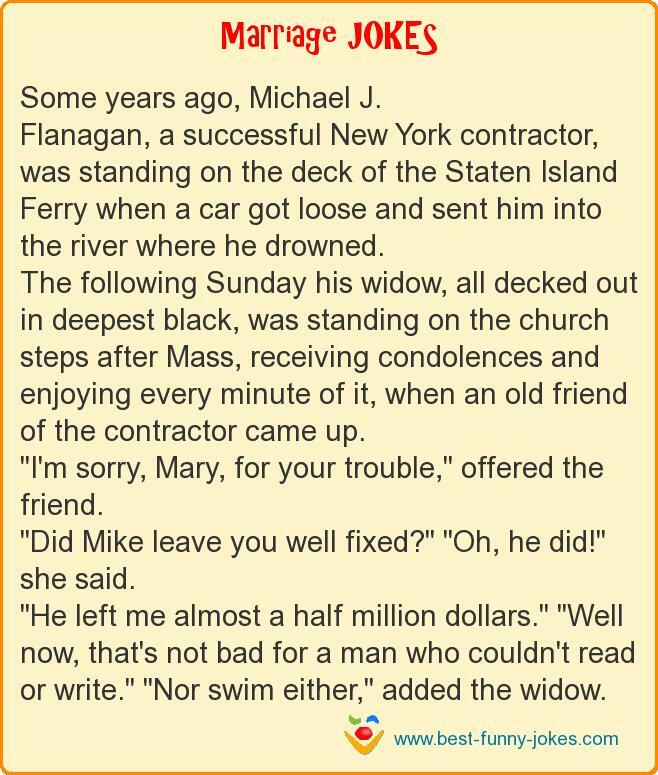 Some years ago, Michael J.
Flanagan, a successful New York contractor, was standing on the deck of the Staten Island Ferry when a car got loose and sent him into the river where he drowned. The following Sunday his widow, all decked out in deepest black, was standing on the church steps after Mass, receiving condolences and enjoying every minute of it, when an old friend of the contractor came up. "I'm sorry, Mary, for your trouble," offered the friend. "Did Mike leave you well fixed?" "Oh, he did!" she said. "He left me almost a half million dollars." "Well now, that's not bad for a man who couldn't read or write." "Nor swim either," added the widow.